The Sable Points Lighthouse Keepers Association is launching a fund drive to repair the lighthouse. "Leave a Print in the Sand" hopes to raise $250,000 to make major repairs, including repair of rusted sections, painting the tower, replacing both the roof and more than 700 original bricks. 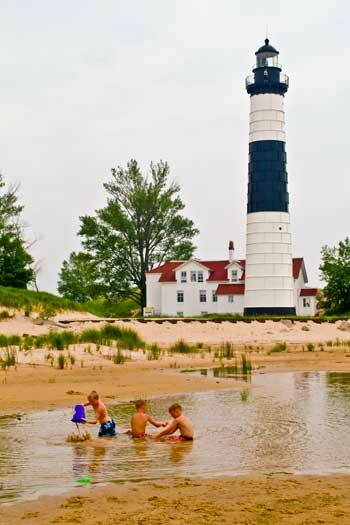 You can purchase a Trex board that will be used in the new walkway around Big Sable Point Lighthouse. Each engraved board costs $100 and allows 25 characters on one line. If you're interested in helping with this project, visit the SPLKA office in downtown Ludington's Center for the Arts, or go to splka.org. 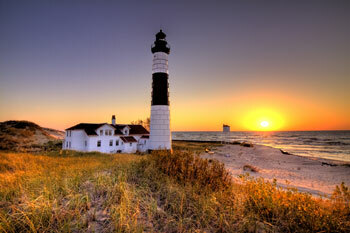 The Sable Points Lighthouse Keepers Association maintains the Big Sable Point Lighthouse, north of Ludington State Park. The lighthouse is open for tours daily 10am-5pm from May 8 to October 30, 2016. You can climb to the top, or visit the gift shop, located in the originial Keeper's Quarters. Lighthouse in the Dunes Field Trips are available by registering in advance with Alan Wernette, State Park Naturalist, at (231) 843-9261. Or you can e-mail Alan at Wernettea@michigan.gov. There is a $5 donation fee to climb the lighthouse tower; $2 for children 11 & under. 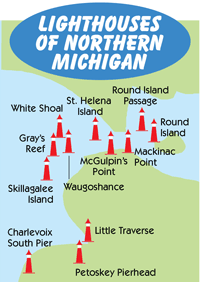 On selected Saturdays through the summer, buses transport visitors from the park rangers house located just inside Ludington State Park to the lighthouse and back for an additional transportation fee. Buses are available from 12pm to 5pm on those days; the round-trip fee is $5 for adults and $2 for children 12 & under. Due to weather conditions and staffing, it may be wise to call ahead at (231) 845-7417, or visit www.splka.org for more information. 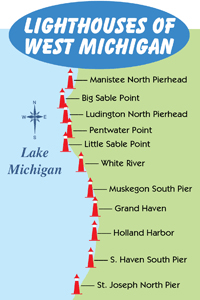 Standing on ground formerly known by French explorers as Grande Point au Sable, the Lighthouse Board recommended a beacon be placed in Ludington. 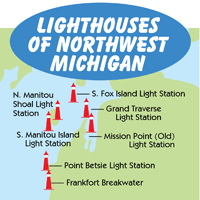 In 1867, Big Sable Point Lighthouse was constructed, and on November 1 of that year, mariners as far as 19 miles out on the lake saw a constant white light for the first time. Climate has not been kind to the lighthouse, and in early 1900, the tower had deteriorated so badly that cement was poured between the plates and brick. It was at this time that the black and white daymark was introduced. 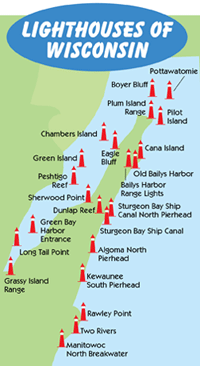 In 1949, Big Sable Point became the last Great Lakes light to be electrified, and automation of the light eliminated the need for a keeper, though the Coast Guard staffed the light until 1972.